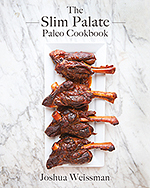 Before we get started I actually wanted to let everyone know that my cookbook is now available in Costco stores! This is a big deal and the more that they sell the more they will buy, so let’s try to sell out at all of their locations. I have the list of locations at the bottom of this post so please go check that out and get a copy for yourself if you haven’t already or grab one for a friend or family member. Things have been incredibly busy in my neck of the woods since I’ll be leaving for Europe soon. My girlfriend and I purchased tickets to depart on September 2nd so obviously we are entirely rapturous about the trip. We will be there for about 2 months with a Eurail pass so we aren’t really limited to any locations as long as they are within the confines of Europe. Actually, if anyone on here lives in Europe and has an extra room, or bed for us to stay for a few days while I’m there I would be incredibly grateful. We might even get a chance to cook a few meals too, just email me at the email on my contact page. Along with the excitement that comes with the ability to travel like this also comes the slight frustration of all the planning that’s needed before you leave. I heard some pretty interesting “must have” items over the phone from my brother. I’m talking crazy things like trash bags, toilet paper, etc. I realize that these could be detrimental in a distressed situation but the first time I heard him say that I thought it was a little ridiculous. Not to mention I have to fit all of the stuff I bring in one backpack. I have a list for the stuff I need to bring but you really don’t want to see that. If you have any recommendations on what to bring please let me know. I also want to try and keep up with recipe posts as much as possible, although I will probably have a little bit more exploration posts as well. So if you feel like living vicariously through me than that’s totally okay. Actually, if you have any thoughts on what you might want to see me post while I’m there go ahead and let me know that too. Clearly I’m looking for suggestions and am completely unashamed of that. If you’re wondering what I’m going to do and how I’m going to stay “Paleo” while I’m traveling, I’ve got you covered. I’ll be posting about that experience while I’m there. Although I would like to point something out. It’s a combination of practicality and experience that will decide my choices. So yes I will stay as “Paleo” as possible but I will not miss out on at least one dish of handmade pasta, pizza, or croissants, while in Europe (hence the fresh tomato pizza I have here for you guys). Specifically because while my health is a priority I also don’t want to miss out on possible once in a life time experiences in food because I’ve never had any of those items made fresh by hand in my whole life and I’m not going to miss it now. But that doesn’t mean I’m going to stop being “Paleo” or anything. It just means I’m making a choice that way I can at least have enjoyed something I’ve never had once. So please understand Paleo police. 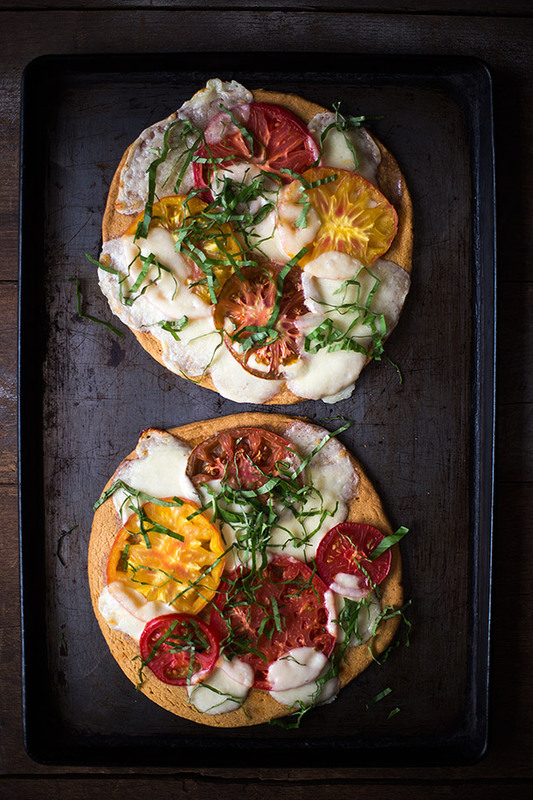 Now I give you a nut free, tapioca free, and can be made dairy free, heirloom tomato pizza margarita. 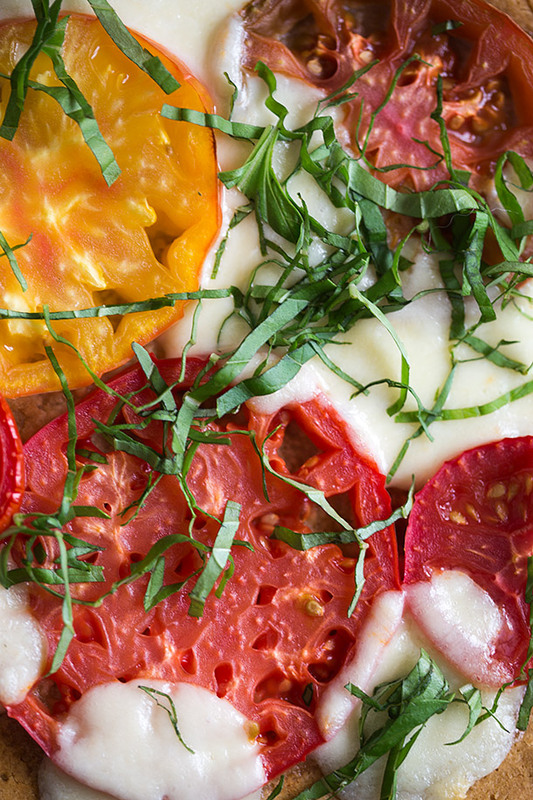 A Pizza Margherita made with heirloom tomatoes on a paleo, gluten free, nut free, tapioca free, crust. The Crust was derived from Meals Made Simple by Against All Grain. 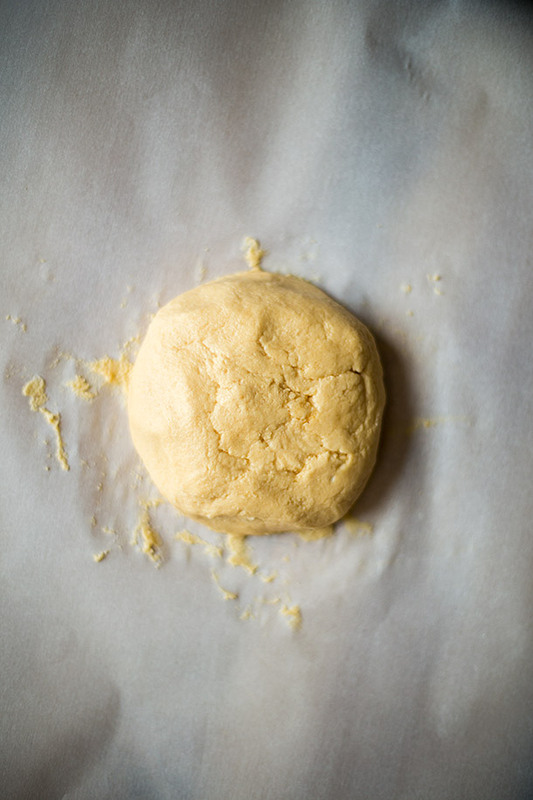 In a stand mixer or food processor combine all the ingredients and mix for about 15 seconds, until a loose dough forms. 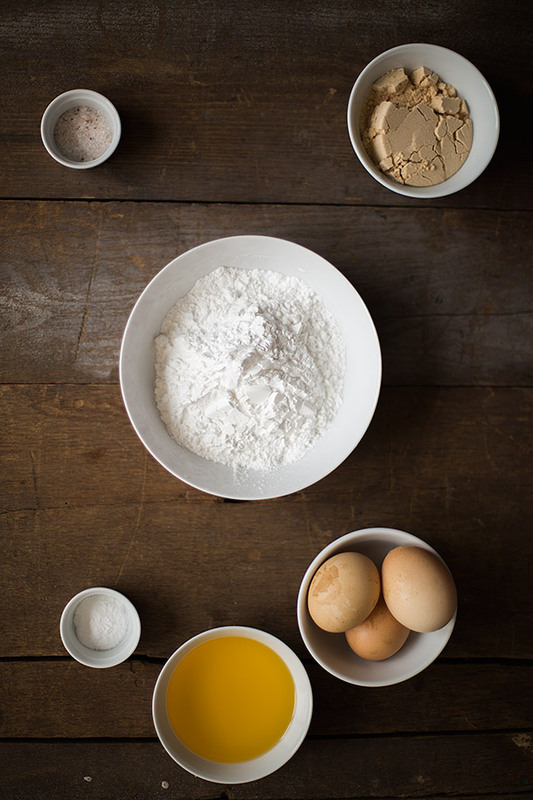 Stop mixing and let sit for 5 minutes, then mix again until a ball of dough forms. If a ball of dough never forms but the mixture is completely incorporated and thoroughly mixed then it's ready. Take half the dough and place it on a sheet of parchment paper and carefully shape into a ball, place another sheet of parchment paper and roll into a circle with a rolling pin until it's a little under ¼ of an inch thick. Repeat this process with the remaining dough with new sheet of parchment. Carefully remove the top parchment paper from the dough, then cut the parchment around the dough so that you have a circle of parchment paper about an inch larger than the circumference of the dough. Do this with both crusts. Place the crusts on the parchment lined baking sheets (only 1 per baking sheet), if you only have one baking sheet then you will have to do 2 batches of the pizza. Bake the crust for 15 minutes then remove and allow to cool for 10 minutes. Increase the oven heat to 450 degrees fahrenheit. Scatter the tomato and mozzarella all around the crust overlapping some tomatoes with cheese and place back into the oven for 10 minutes. Stack the basil leaves on top of each other and roll like a cigar and slice thin to get ribbons. Garnish the finished pizzas with basil evenly, drizzle with a little bit of olive oil, then serve immediately. Let’s sell out at these Costco stores! What a beautiful pizza, incredible pictures too. The colors pop so much! Good luck and have an amazing time! I live in Zürich, Switzerland and you are welcome to stay over if you pass this way 🙂 We are actually not around from Oct. 11th-27th, but otherwise we’ll be around and we have a guest room. I was fortunate to experience the baked goods of Germany and the pasta of Italy before discovering Paleo. There’s absolutely nothing like it. Indulge as much as you are able/can tolerate and enjoy your trip and experience. When in Rome: stay in Trastevere if you can, Il Gelato di San Crispino (near the Trevi Fountain) is a must!, and eat dinner with the locals at 10:30pm. Trier, Germany is a great historic city on the Mosel. Two universities also give it a “college-town” vibe. The Riesling from that area is excellent. What is the differnce between arrowroot and tapioca starch? For postings, I would just love to hear about the different food you encounter – how it compares to what people eat in the US. Question: The pizza crust boasts of being tapioca starch free. That’s the first time I’ve seen that. Is tapioca non-paleo, or something some people avoid the way they would grains? Thanks! I would suggest TP as well, and you can flatten it pretty well and put it in the bottom of your pack. I toured Europe 25 years ago, and I collected swatches of TP because it varied so much from country to country! As far as trash bags go, I would suggest this instead: pack your clothes in large ziploc bags–1 gallon or larger. They keep the dirty stuff separate from the clean stuff, they keep your clothes dry if your pack gets wet, they help your clothes pack flatter, and they can be used as trash bags if necessary! Go to Switzerland if you can!! You have lodging, and it’s the most beautiful country in my opinion!! I love the option for pizza that is not made with cauliflower, just so that we can have a bread moment. I halved the recipe but added a bit more arrowroot floor to accommodate the two eggs. This was perfect. It was filling and flavourful with the simple toppings. Thank you so much. 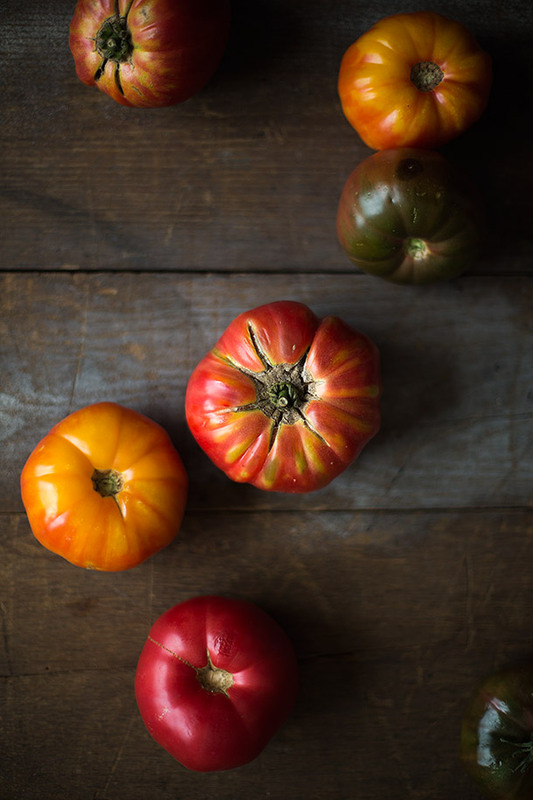 This looks wonderful – I love the gorgeous colours of heirloom tomatoes! Thanks! This one was shot on my new coffee table by the way ;). Love pizza! Oh, by the way, I found your cookbook in a store near me. Might I add, this is on a tropical island in the middle of the Pacific ocean. Be ready for healthy eating converts. No way! Thanks for the heads up, that’s gray! And thank you so much! 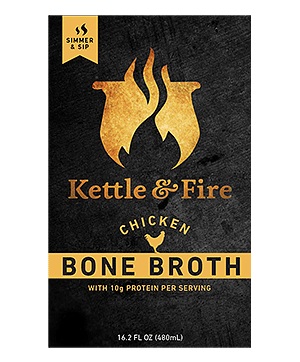 Just to add to the available Costco list….I scooped mine up at an Oregon location! Pizza looks amazing. Journey well and bring back life changing memories! I have an Oregon location listed, was that the one you found it at? Thanks! That is so exciting. I just got back from 2 weeks. Time spent in mostly Barcelona and all over Italy. Not sure of your budget, but there is a hostel/hotel in Barcelona that had very reasonable private rooms. It’s called TOC and is very centrally located. As far as eating goes I went to restaurants of all kinds. Luckily, for u, meals are protein heavy. Some of the restaurants I will list below are expensive, but worth it. I can personally recommend them. Just look them up on tripadvisor and decide. For breakfast you must try chocolate and churros. A place called Chok is the best. Deep, dark, thick chocolate. For pastry, I stumbled upon a place I read about called La Pastisseria. A must visit. A visit to the market, La boqueria is a must for any foodie. Go early. Another highlight…. La Sagrada Familia. If you make it to Naples…. You must, must go to Da Michelle for pizza. Only two types… Marinara and Margherita pizza. At 4.5 euros, you get a pizza larger than 12″ and it is ethereal. So, after saying all this, I hope you make it to Barcelona! Have fun!!!! 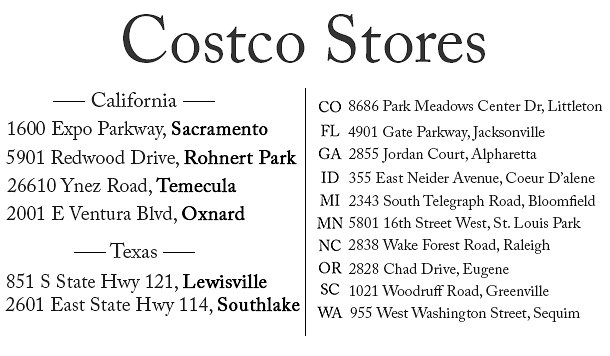 My costco isn’t listed (IL) but I’ll be checking anyway. I think once you really think about carrying your things for a couple of months, it is easier to pack light. You will be able to do laundry almost everywhere, so no need to overpack on clothes. If you are staying in hostels, people often time share cooking duties. Think about bringing a small bag of your favorite spices. Many hostels won’t have this and it would be easy to carry. I’ve been making a paleo pizza lately with an almond flour/arrowroot/coconut flour crust which is pretty darn good, but I always kind of wish it didn’t have the almond flour. Can’t wait to try this one! I went backpacking through Europe when I graduated from High School! Probably one of the best decisions I have ever made! Life changing! I actually found that those “space bags” that compact things really helped save room. Your clothes get a little more wrinkled but I didn’t really care. Keep a journal! You will have lots of time on the train to write and think.Its fun to look at later because you forget little things about the trip. You will have the time of your life! Enjoy! Europe is awesome and I hope you are enjoying your trip so far. If you plan to visit the Netherlands my husband and I will be happy to host you and your girlfriend. I’m gluten-intolerant so we follow a gluten-free mostly paleo diet. We are foodies and plan our trips around the places we want to eat at. 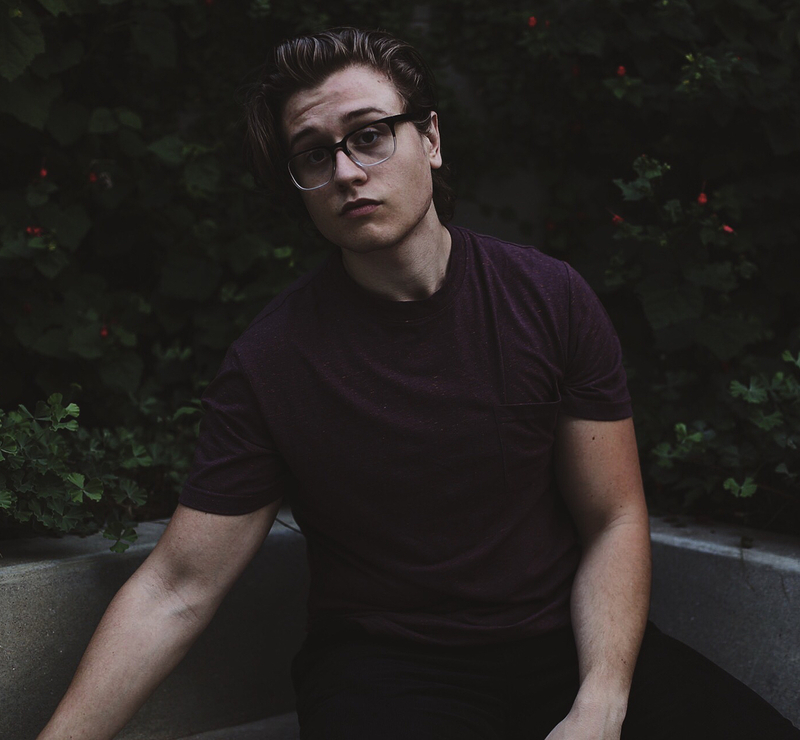 It would be lovely to talk about food and maybe even cook together. And since this is the first time i’m commenting I must also add that your recipe for dark chocolate cookies with sea salt is amazing! Excited to try this pizza! can I substitute Coconut oil for ghee? I stopped reading the recipe at the point you said Buffalo mozzarella is practically the same thing as fresh cow’s milk mozzarella. I hope that you do try the pizza if you make it to Southern Italy. Hopefully then you’ll be able to tell the difference.